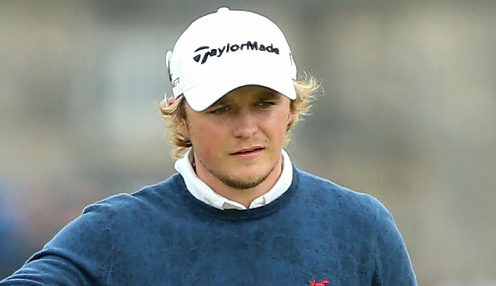 Eddie Pepperell battled through the cold and rain to shoot a final-round 72 and complete a wire-to-wire two-shot win in the British Masters at Walton Heath with 9-under 279. Fuelled by a hole-in-one during his opening round, the popular Englishman had built a three-stroke lead heading into Sunday's final lap at the famed Surrey venue. I'm delighted to go wire-to-wire, especially at this event, I'm over the moon. Pepperell looked to be keeping his rivals at bay before three-putting the ninth for bogey but he responded in style by holing his approach for eagle - his fourth of the week - at the par-5 10th hole. With others making mistakes, Alexander Bjork emerged as his main rival on the back nine and the Swede reduced the gap to a single shot as Pepperell made bogeys at 15 and 16. But Bjork made a mess of the last and his bogey allowed Pepperell to complete a two-shot success and claim his second victory of the season. Australian Lucas Herbert finished tied third with England's Jordan Smith, while Sam Horsfield, Tom Lewis and Julian Suri claimed joint fifth. "It's brilliant," said Pepperell after banking a sixth top ten in his last nine starts and moving up to seventh on the Race to Dubai. "I said yesterday I wouldn't know how it felt being in the lead at this event as opposed to another one but now that I've won it, it does feel special. Pepperell is 101.00 to win next year's Open Championship at Portrush in Ireland, with Rory McIlroy 10.00 and Shane Lowry 51.00.